Warren Buffett and Bill Gates rank first and second on Forbes' list of the 400 richest Americans. The rich got quite a bit richer this past year, according to this year's rankings of the 400 wealthiest Americans. Forbes magazine released its annual list on Wednesday, and the combined net worth jumped 13% to $1.7 trillion in 2012, up from $1.5 trillion in 2011. The boost came thanks to the rising stock market and a rebound in real estate values - especially in cities like Los Angeles and New York. Microsoft (MSFT) founder Bill Gates remained at the top of the list, as his net worth rose $7 billion to $66 billion. His pal Warren Buffett, CEO of Berkshire Hathaway (BRKA), also saw his net worth climb by $7 billion, which helped him retain the number two spot on the list with $46 billion. 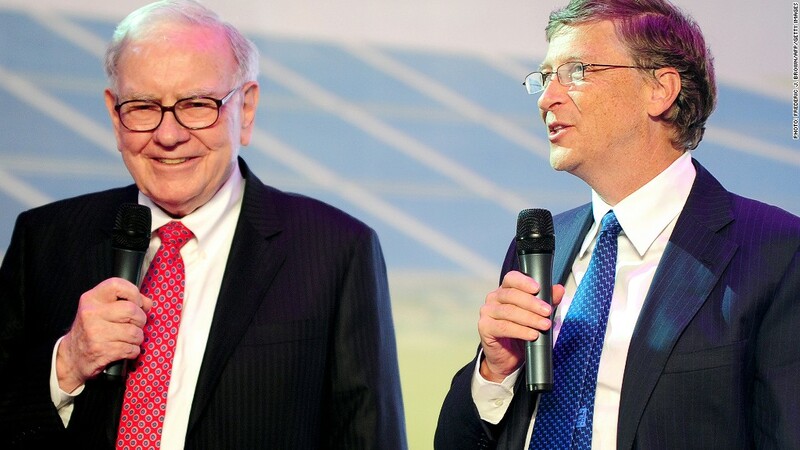 Together, Gates and Buffett have led an effort to get fellow billionaires to donate much of their wealth to charity. Another software mogul, Oracle (ORCL) CEO Larry Ellison, enjoyed the biggest increase in wealth of anyone on the list -- a jump of $8 billion. That put his net worth at $41 billion, ranking him No. 3 on the list. The average net worth of a member of the Forbes 400 hit $4.2 billion. That's the highest level it's been in at least a decade, according to the magazine, and up from $3.8 billion last year. The net worth cut off to make the list this year was $1.1 billion, up from $1.05 billion in 2011. Forbes said that 241 members of the 400 enjoyed an increase in their net worth, while only 66 members suffered a decline. Among those who fell out of the top 10 were two politically active billionaires. Liberal George Soros fell to No. 15 on the list. Casino mogul Sheldon Adelson, who has given a combined $25 million to the super PACs supporting Newt Gingrich and later Mitt Romney, fell to No. 12 on the list. Both saw a steep drop in the value of their investments.